An afternoon of classic modern dance by Graham and other choreographers, performed by the Company’s educational partners. For more information, contact Director of Graham Resources Oliver Tobin at 212-229-9200 x19 or otobin@marthagraham.org. 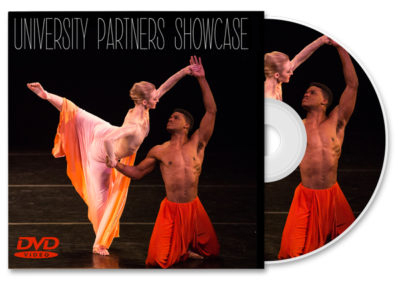 2019 University Partners Showcase participants: Pre-order your copy of the official 2019 University Partners Showcase DVD today! Professionally filmed the Joyce Theater, New York City’s premiere dance venue, on April 6th, 2019. Licensees from University and High School dance programs are invited to participate in the biennial University Partners Showcase, performing in New York City on the Martha Graham Dance Company stage. Students may perform Graham classics or works by other contemporary choreographers in keeping with the theme of the Company’s season. Past participants include: Adelphi University, Franklin and Marshall College, Graham 2, The Hartt School, Interlochen Arts Academy, LaGuardia High School of Music & Art and Performing Arts, Marymount Manhattan College, Montclair State University, New World School of the Arts, Paul Taylor Teen Ensemble, Point Park College, Rutgers University, Sarah Lawrence College, Skidmore College, Teens@Graham, University of Arizona, University of Iowa, University of North Carolina at Charlotte, and University of North Carolina at Greensboro.